This is an excellent app for teaching kids about an event that they may be experiencing some anxiety about: airplane travel and the pre-boarding process. The goal and purpose of the Smart Fish: Frequent Flyer app is to teach children in the 3-7 year-old age group about airplane travel and the steps they would be going through during the pre-boarding process in the airport. These pre-boarding steps, such as packing the right toys and cloths and going through the security check process, can cause everyone anxiety, not just the kids, so this is a great way to help prepare for the event and hopefully reduce the anxiety. The young user can choose their own character and work through the entire preparation process right from choosing the right clothing for the expected weather at their destination all the way up to taking a taxi to the airport and removing their shoes at the security gate. 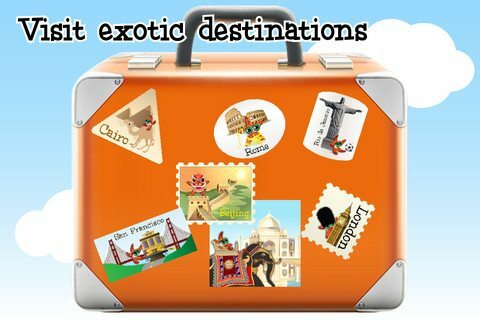 There are 13 different destinations to travel to provding the child with a great variety of interactive travelling experiences. The quality is quite excellent and it’s apparent that the app developers have put a great deal of effort into the design of this app. The graphics are colorful and the game play is quite snappy and crisp. The sound effects are fun and there are both visual and audio cues to guide the child through the game play. It’s a very interactive app that allows the user to tap and drag itens onto the security table and when packing a suitcase, so it’s a great deal of fun for the targeted age group. The education value of the app is great for what it’s aiming to do, which is prepare a child for airplane travel. Don’t expect the child to learn a great deal about the destination city they are travelling to, but it does help to stimulate discussion between the child and the parent. Smart Fish: Frequent Flyer is not the most stimulating of apps I’ve played, even when evaluating the app from a 3-7 year-old viewpoint, but it does add some entertainment to an activity that’s not always the most entertaining of events.The small touches, like allowing the user to select their own color suitcase and design their own avatar are great touches and very much add to the apps entertainment value. For $2.99, it’s a reasonable value for an app of this nature. It really is an app that’s there to suit a purpose and therefore will really only be targeting a specific group. To that group of airplane travellers with young kids, this app is a great value and worth the couple bucks. It is an easy to use app and includes a tutorial to start off with in order to learn how the app works. There are social media links built into the game with the purpose of allowing the parent to recommend the app to others on facebook, twitter or through email, but the link to get to these sharing options must be tapped and held for three seconds to open. There are no ads or in-app purchases however, which is a positive attribute.